The USPTO has issued a notice of proposed rulemaking (NPRM) on patent and PTAB fees with the goal of raising revenue in order to improve patent quality and examination timeliness. Public comments are due by December 2, 2016. Major increase in inter partes review fees – from $23,000 to $30,500 (petition + institution). Similar increases for PGR and CBM. Large fee increase for design patent search, examination, and issue fees — hopefully the PTO will increase its quality on that front. New fee for sequence listing submissions of > 300 MB ($1000) and > 800 MB ($10,000). Standard fees for utility applications are relatively steady => only about 10% increase. In July 2016, I discussed a letter from 45 professors arguing for statutory reforms to limit venue in patent infringement cases. The letter focused on the “staggering concentration of patent cases in just a few federal district courts” and offered the the positive conclusion that such a concentration is “bad for the patent system.” In the abstract, concentration of cases is not necessarily bad — here though, the particular arguable “badness” is that the high concentration of cases is in the Eastern District of Texas rather than Silicon Valley, New York, Chicago, or Delaware. Under the current statutory framework (as interpreted), venue is proper in any jurisdiction where the court has personal jurisdiction over the defendants. For any large company operating in the US, this current approach leads to the results that venue for a patent infringement case is proper in any federal court across the country – including those located in the Eastern District of Texas. As legal academics, economists, and political scientists who conduct research in patent law and policy, we write to express our concerns about the recent push for sweeping changes to patent litigation venue rules, such as those proposed in the VENUE Act. These changes would vastly restrict where all patent owners could file suit—contrary to the general rule that a plaintiff in a civil lawsuit against a corporate defendant can select any court with jurisdictional ties to the defendant. Given the recent changes in the patent system under the America Invents Act of 2011 and judicial decisions that have effectively weakened patent rights, we believe that Congress should adopt a cautious stance to enacting additional changes that further weaken patent rights, at least until the effects of these recent changes are better understood. Proponents of amending the venue rules have an initially plausible-sounding concern: the Eastern District of Texas handles a large percentage of patent infringement lawsuits and one judge within that district handles a disproportionate share of those cases. The reality is that the major proponents of changing the venue rules are primarily large high-tech companies and retailers with an online presence sued in the Eastern District of Texas that would rather litigate in a small number of more defendant-friendly jurisdictions. Proponents for the VENUE Act argue that “[t]he staggering concentration of patent cases in just a few federal district courts is bad for the patent system.” As an initial matter, data indicates that filings of patent lawsuits in the Eastern District of Texas have dropped substantially this year—suggesting a cautious approach until trends have stabilized. Contrary to claims by its proponents, legislative proposals like the VENUE Act would not spread lawsuits throughout the country. In fact, these same proponents have found that restricting venue in a manner similar to the VENUE Act would likely result in concentrating more than 50% of patent lawsuits in just two districts: the District of Delaware (where most publicly traded corporations are incorporated) and the Northern District of California (where many patent defendants are headquartered). Instead of widely distributing patent cases across numerous districts in order to promote procedural “fairness,” the VENUE Act would primarily channel cases into only two districts, which happen to be districts where it is considered much more difficult to enforce patent rights. Proponents for the VENUE Act have argued that the Eastern District of Texas is reversed more often by the Federal Circuit than other jurisdictions, claiming that in 2015 the Federal Circuit affirmed only 39% of the Eastern District of Texas’s decisions but affirmed over 70% of decisions from the Northern District of California and District of Delaware. These figures are misleading: they represent only one year of data, mix trials and summary judgment orders, and fail to take into account differences in technology types and appeals rates in each district. In fact, a more complete study over a longer time period by Price Waterhouse Coopers found that the Eastern District of Texas affirmance rate is only slightly below the national average for all districts. The Federal Circuit recently confirmed in In re TC Heartland (Fed. Cir. Apr. 29, 2016) that 28 U.S.C. § 1400(b) provides that a corporate defendant in a patent case—like corporate defendants in nearly all other types of cases—may be sued in any district in which personal jurisdiction lies. Constitutional due process requires a “substantial connection” between the defendant and forum. Thus, contrary to its title and the claims of its proponents, the VENUE Act does not re-establish a “uniform” litigation system for patent rights by requiring substantial ties to the forum. Instead, the Act thwarts the well-established rule that plaintiffs can bring suit in any jurisdiction in which a corporate defendant has committed substantial violations of the law. The VENUE Act would raise costs for many patent owners by requiring them to litigate the same patent against multiple defendants in multiple jurisdictions, increasing patent litigation overall. In recent years, the America Invents Act’s prohibition on joinder of multiple defendants in a single lawsuit for violating the same patent has directly resulted in increased lawsuits and increased costs for patent owners. Moreover, the VENUE Act would also result in potentially conflicting decisions in these multiple lawsuits, increasing uncertainty and administration costs in the patent system. S.2733, Venue Equity and Non-Uniformity Elimination Act of 2016, https://www.congress.gov/114/bills/s2733/BILLS-114s2733is.pdf. See 28 U.S.C. § 1391(c)(2). See generally Ferens v. John Deere Co., 494 U.S. 516, 527 (1990) (“a plaintiff . . . has the option of shopping for a forum with the most favorable law”). These include, among others: (1) administrative procedures for invalidating patents created by the America Invents Act, which have had extremely high invalidation rates, leading one former federal appellate judge to refer to these procedures as “death squads,” and (2) several decisions by the Supreme Court and the Federal Circuit that have drastically curtailed patent rights for many innovators. See Adam Mossoff, Weighing the Patent System: It Is Time to Confront the Bias against Patent Owners in Patent ‘Reform’ Legislation, Washington Times, March 24, 2016, http://www.washingtontimes.com/news/2016/mar/24/adam-mossoff-weighing-the-patent-system/. Colleen Chien & Michael Risch, A Patent Reform We Can All Agree On, Wash. Post, June 3, 2016, https://www.washingtonpost.com/news/in-theory/wp/2015/11/20/why-do-patent-lawyers-like-to-file-in-texas/. See Michael C. Smith, “Hot But No Longer Boiling“ – EDTX Patent Case Filings Down almost Half; New Case Allocation and Procedures (No More Letter Briefing for SJ motions), EDTexweblog.com, July 21, 2016, http://mcsmith.blogs.com/eastern_district_of_texas/2016/07/edtx-patent-case-filing-trends-new-case-allocation-and-procedures.html. Colleen Chien & Michael Risch, What Would Happen to Patent Cases if They Couldn’t all be Filed in Texas?, Patently-O, March 11, 2016, https://patentlyo.com/patent/2016/03/happen-patent-couldnt.html. This study also finds that 11% of cases would continue to be filed in the Eastern District of Texas, concentrating nearly two-thirds of all cases in three districts. See id. The authors of this study are presently expanding their investigation to an enlarged data set, which will also capture additional aspects of the VENUE Act. Neither the data nor their results are available yet. However, we have no reason to believe that the expanded data or analysis will produce results other than what has already been shown: a high concentration of patent cases in a small number of districts. See PricewaterhouseCoopers LLP, 2015 Patent Litigation Study (May 2015) (“PWC Study”), http://www.pwc.com/us/en/forensic-services/publications/assets/2015-pwc-patent-litigation-study.pdf. Ryan Davis, EDTX Judges’ Love of Patent Trials Fuels High Reversal Rate, Law360 (Mar. 8, 2016), http://www.law360.com/articles/767955/edtx-judges-love-of-patent-trials-fuels-high-reversal-rate. See PWC Study, supra note 7 (finding an average affirmance rate of 48% for all districts, compared to an affirmance rate of 42% for the Eastern District of Texas). See Burger King Corp. v. Rudzewicz, 471 U.S. 462, 475 (1985). See generally Gulf Oil Corp. v. Gilbert, 330 U.S. 501, 508 (1947) (“[T]he plaintiff’s choice of forum should rarely be disturbed.”). See Christopher A. Cotropia, Jay P. Kesan & David L. Schwartz, Unpacking Patent Assertion Entities (PAEs), 99 Minnesota Law Review 649 (2014), http://www.minnesotalawreview.org/wp-content/uploads/2015/02/REVISEDSchwartzetal_MLR.pdf. 28 U.S.C. § 1400(b) provides the venue requirements for patent cases – limiting proper venue to (1) “the judicial district where the defendant resides” or (2) “where the defendant has committed acts of infringement and has a regular and established place of business.” This appears to be quite narrow in that few defendants actually reside or have an established place of business in the Eastern District of Texas. The catch, however, comes in the form of 28 U.S.C. § 1391(c). That provision expansively defines the term “reside” — indicating that “except as otherwise provided by law . . . [a defendant] shall be deemed to reside . . . in any judicial district in which such defendant is subject to the court’s personal jurisdiction with respect to the civil action in question.” Section 1391(c) appears to completely gut the limits of 1400(b) to indicate that venue is proper whenever a court has personal jurisdiction. TC Heartland argues that the statute should be interpreted differently – namely that the express limits of 1400(b) should take precedence over the broad definition of 1391(c) as suggested by the “otherwise provided by law” exception. A group of 45 professors sent the following letter to Congress arguing for statutory reforms to limit venue in patent infringement cases. One focus of this move is to direct intention toward a focused and limited action rather than another round of comprehensive patent reforms. This type of limited reform could come as part of a late-session omnibus package. The undersigned patent law academics and economics experts write to express our support for patent venue reform. Changes to the venue rules are necessary and urgent to address the significant problem of forum shopping in patent litigation cases. As Colleen Chien and Michael Risch recently wrote for the Washington Post, “[t]he staggering concentration of patent cases in just a few federal district courts is bad for the patent system.” It is imperative that Congress address patent venue reform to return basic fairness, rationality, and balance to patent law. Specifically, venue reform that treats plaintiffs and defendants equally by requiring a substantive connection to the venue on the part of at least one party is critical to ensure fairness and uniformity in patent law. As a result of current venue rules, though there are 94 federal judicial districts, a single district is home to nearly half of all patent cases. Of the 5,819 patent cases filed in 2015, nearly half— 2,541 cases—were filed in the Eastern District of Texas, and 95% of those cases were filed by non-practicing entities (NPEs). And the Eastern District of Texas’s percentage of patent cases has been steadily increasing over the last several years, rising from 11% in 2008 to 44% in 2015.4 By comparison, the Northern District of California, home of Silicon Valley, saw only 228 patent cases filed in 2015. A single judge in the Eastern District of Texas had 1,686 patent cases filed assigned to his docket in 2015—in other words, a single judge handled two-thirds of the patent cases in that district, and nearly one-third of all patent cases nationwide. If all of those cases were to go to trial, that single judge would have to complete 4 to 5 trials every day of the year (including weekends)—not counting any time for motions or other hearings. The burden of this overwhelming number of cases leads, unsurprisingly, to a high reversal rate on appeal. The United States Court of Appeals for the Federal Circuit affirmed only 39% of the decisions from the Eastern District in 2015. One reason for the disproportionate number of patent filings in the Eastern District of Texas is that the district employs procedural rules and practices that attract plaintiffs, including by delaying or denying the ability of defendants to obtain summary judgment to terminate meritless cases early. For example, the district requires parties seeking summary judgment in patent cases to first seek permission before filing any summary judgment motion, the effect of which is to delay and deter early resolution of cases. While parties can seek transfer out of the district, some NPEs have opened offices in the district simply for the purpose of bolstering their arguments to stay in their preferred venue. The average grant of transfer in this venue took over a year (490 days), and the average denial of a transfer motion took 340 days, meaning that even cases that are ultimately transferred remain pending in the district for nearly a year. Local discovery rules permit discovery to go forward even while a motion for transfer is pending, so even successfully moving to transfer only partially relieves the expense of litigating in a distant venue and the burden on the court. The disproportionate number of patent plaintiffs—and NPEs in particular—bringing cases in a single venue ultimately results in wasted judicial resources, as more of those cases are overturned on appeal. For accused infringers, the costs of innovation are increased when they have little or no connection to the venue and are forced to litigate from a distance. The harm caused by abuse of the system and the resulting loss of trust in the uniformity and justness of the U.S. patent law system is unmeasurable. This type of dynamic is bad for patent law, and bad for United States innovation. It is thus critical that Congress act now to pass targeted patent venue reform. Colleen Chien and Michael Risch, A Patent Reform We Can All Agree On, Wash. Post, (June 3, 2016, 3:07pm). Data from Lex Machina (analysis as of June 7, 2016). Joe Mullin, Trolls made 2015 one of the biggest years ever for patent lawsuits, arstechnica (Jan. 5, 2015). DocketNavigator Analytics, New Patent Cases Report, (report run June 2, 2016). Lex Machina, Patent Litigation Year in Review 2015, at 5 (Mar. 2016). Ryan Davis, EDTX Judges’ Love of Patent Trials Fuels High Reversal Rate, Law360.com (Mar. 8, 2016). See, e.g., Judge Rodney Gilstrap, Sample Docket Control Order—Patent. Lex Machina, Patent Litigation Year in Review 2015, 10 (Mar. 2016). In its petition for writ of mandamus, TC Heartland raised a set of interesting venue and personal jurisdiction claims – basically arguing that both the statute and Supreme Court precedent strongly limit where patent claims can be brought. In its new decision, however, the Federal Circuit panel has rejected the petition – finding that “Heartland’s arguments are foreclosed by our longstanding precedent.” This result was expected – likely even by Heartland’s counsel Prof John Duffy and Jim Dabney – and the long game has seemingly always been focused on en banc review and a potential supreme court review. An eventual win by Heartland would result in a major shake-up of patent litigation by greatly reducing the concentration of patent cases – especially those in the Eastern District of Texas. Heartland alleged that it is not registered to do business in Delaware, has no local presence in Delaware, has not entered into any supply contracts in Delaware or called on any accounts there to solicit sales. But Heartland admitted it ships orders of the accused products into Delaware pursuant to contracts with two national accounts. Based upon this setup, Heartland argues (1) that it does not “reside” in Delaware for venue purposes according to 28 U.S.C. § 1400(b); and (2) that Delaware district court lacks specific personal jurisdiction over it for this civil action. Unfortunately for Heartland, these same arguments were raised and resolved by VE Holding Corp. v. Johnson Gas Appliance Co., 917 F.2d 1574 (Fed. Cir. 1990). Although Heartland presented an argument that an amendment to the statute overruled VE Holdings, that argument was flimsy and rightly rejected by the appellate panel. Rather, the real argument – now to be presented en banc – is that VE Holdings was wrongly decided and represents a misinterpretation of both the statute and Supreme Court precedent. In the dispute, Heartland has asked the court to reconsider its interpretation of the patent venue statute 28 U.S.C. § 1400(b) and order that the limiting elements of the provision be given effect. Under the proposed interpretation, a patent infringement case could only be filed in districts either (1) the defendant resides or (2) the defendant has both committed acts of infringement and has a regular and established place of business. This proposal stems directly from the language of 28 U.S.C. § 1400(b) which requires either (1) residency or (2) a combination of infringing acts plus a regular-place-of-business as a prerequisite to proper patent venue. For the past several decades the limits of § 1400(b) have been given essentially no weight after being undermined by 28 U.S.C. § 1391(c). This broadened provision undermines § 1400(b) by providing a very broad definition of the term “resides” — indicating that that “except as otherwise provided by law,” a defendant will be deemed to “reside” in any venue where the defendant is subject to that court’s personal jurisdiction in the action at hand. When § 1400(b) and § 1391(c) are read together, it appears that patent cases can be filed in any venue with personal jurisdiction over the defendant. The point of the TC Heartland mandamus action is that those two provisions should not be read together, but instead, the more traditional and limited definition of “residency” should apply when interpreting 1400(b). On TC Heartland’s side is Fourco Glass Co. v. Transmirra Products Corp., 353 U.S. 222 (1957). In that case, the Supreme Court ruled that “28 U.S.C. § 1400(b) is the sole and exclusive provision controlling venue in patent infringement actions, and that it is not to be supplemented by the provisions of 28 U.S.C. § 1391(c).” This statement was reiterated by the Supreme Court in Brunette Mach. Works Ltd. v. Kockum Indus., Inc., 406 U.S. 706 (1972) (“Congress placed patent infringement cases in a class by them-selves, outside the scope of general venue legislation.”). Congress then amended the statute which led the Federal Circuit to hold that Fourco no longer held sway. The world continues to spin as we await a decision in the TC Holdings mandamus venue action. Sitting by designation in a district court case, Federal Circuit Judge Bryson has rejected a defendant’s contention that VE Holdings had been overruled by the 2011 amendments to the patent venue statute. Script Security Solutions, L.L.C. v. Amazon.com, LLC, No. 2:15-CV-1030-WCB, 2016 WL 1055827, (E.D. Tex. Mar. 17, 2016) (Thanks to Robert Matthews for this update). En Banc: Does a Confidential Manufacturing Supply Contract Trigger the On Sale Bar? More to come on this case, but I wanted to provide readers with the filed briefs below. Briefing is now complete in the en banc challenge to the ‘no-supplier-exception’ to the on-sale bar. The en banc question here focuses on when a manufacturing supply contract crosses-the-threshold into impermissible “on sale” activity and raises the on-sale bar of 35 U.S.C. § 102(b) (pre-AIA). Although the patents at issue in this case involve pre-AIA law, the same “on sale” language is found in the revised statute. If the post-AIA statute is interpreted so that sales still include ‘secret sales’ then the decision here will continue to be of substantial importance. (Note that the U.S. Government argues that pre-AIA precedent is wrong and that secret sales should not trigger the on sale bar even pre-AIA). 1. Do the circumstances presented here constitute a commercial sale under the on-sale bar of 35 U.S.C. § 102(b)? (a) Was there a sale for the purposes of § 102(b) despite the absence of a transfer of title? (b) Was the sale commercial in nature for the purposes of § 102(b) or an experimental use? 2. Should this court overrule or revise the principle in Special Devices, Inc. v. OEA, Inc., 270 F.3d 1353 (Fed. Cir. 2001), that there is no “supplier exception” to the on-sale bar of 35 U.S.C. § 102(b)? The parties here include MedCo (the Patentee) who (prior to filing the patent application) hired Ben Venue Mfg. to actually produce ‘validation batches’ of its bivalirudin drug. Hospira is challenging the patent and is seeking approval to market a generic version. The original panel found that the sale constituted an invalidating on-sale bar. Of interest here, the “sale” was Ben Venue’s “sale of services” to manufacture the patented product-by-process rather than sales of the product themselves. The original panel found no principled distinction between these concepts – thus applying the on sale bar. Because the ‘sales’ at issue were associated with MedCo’s ‘validation batches,’ the patentee has also now argued experimental use. US Amicus Brief (secret sales and secret offers should not be seen to trigger the on sale bar). Gilead Amicus Brief (only “arm’s length sales between two entities” qualify for the on sale bar; here that does not apply when an inventor controls (through contract) the activities of the manufacturer). PRMA Amicus Brief (Parties should be permitted to outsource manufacturing prior to filing for patent protection). Guest Post: What Would Happen to Patent Cases if They Couldn’t all be Filed in Texas? Today, the Federal Circuit heard oral argument in the mandamus petition brought in the TC Heartland case. At stake is where patentees can properly bring their cases, a question that has received an inordinate amount of attention–even from comedic TV shows–in light of the high concentration of patent filings in just a handful of venues. We have followed this case with interest because, as we have written before, we believe that revising venue may be a reform that the patent system’s diverse stakeholders can agree upon. Although the reasons that plaintiffs flock to Eastern Texas and a few other districts are contested, we believe that a system that incentivizes skating rinks outside of courthouses to curry favor with local juries is far less defensible. How did we get here? For nearly 90 years, it was settled law that special rules limiting venue governed patent lawsuits. Congress changed the general venue law in 1988, and the Federal Circuit interpreted this as removing the special rule (28 U.S.C § 1400)’s restrictions, enabling plaintiffs to choose, essentially freely, among district courts where to file their patent suits. Where might we be headed? Petitioners now argue under a variety of theories that the restrictions in 28 U.S.C. § 1400(b) in effect be reinstated, and given greater effect. Other than our concerns about the end result, we take no position at this time on the legal merits of any particular argument. In any event, it’s not our opinion that matters. If the Federal Circuit agrees, patent venue would revert to either (1) defendant’s residency (place of incorporation) or (2) a combination of infringing acts plus a regular-place-of-business. Congressional proposals are expected to both broaden and narrow this definition, though we caution against the development of proposals that make it difficult for the plaintiff to determine appropriate venue without undertaking substantial discovery in the first place or that makes the determination of “real” places of business uncertain. But the Federal Circuit will not wait for Congress. How significant would a reversion to § 1400 be? Although impossible to predict with certainty, we think it is worthwhile to consider, so we performed an analysis that attempts to model that venue rule. We considered what would have happened in 2015, had the proposed interpretation been in effect then. Last year patent plaintiffs filed 44% of their cases in the Eastern District of Texas. Where would they have filed (assuming that they would have filed at all) had the previous interpretation of Section 1400 rule been in place? That is to say, where would patent plaintiffs file if they couldn’t all go to Texas? No match – none of the above. The resulting analysis suffers from a few limitations. First, our data sources are likely to contain a modest number of errors and only roughly approximate permissible defendant venues. Second, though we assume that infringement took place in each district where the defendant has a location, this assumption may not hold in every jurisdiction. 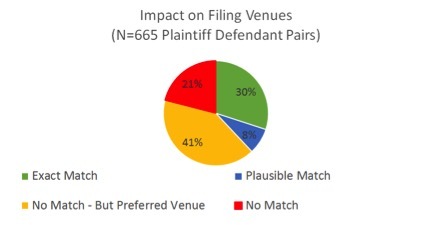 Third, outside of “exact” matches, it’s hard to tell with certainty where plaintiffs would choose to file – though we assume that plaintiffs plausibly would file where they have before, due to greater familiarity with the court, and that certain matches were “preferred” because we assume that P would prefer to file where others in the P’s class have filed in the past, other factors may trump. Finally, our dataset is small – only 500 cases – though we are in the process of extending the analysis. Still, we believe that the results from this initial analysis are instructive, and share them below. As shown in Figure 1, we find that though approximately 30% of “cases” would have been able to be filed as they were, 70% of them would not have able to be filed as is. While 8% could have been filed where the plaintiff had filed before, in 62% of cases, plaintiffs would have to file in a jurisdiction they had never filed before, though 41% of the time, a jurisdiction preferred by other plaintiffs of the same time was available. 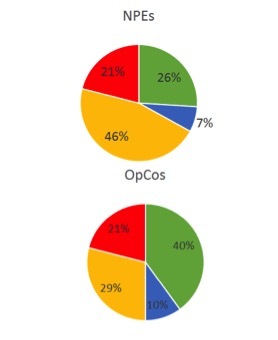 Applying codings for entity type provided by Unified Patents in Figure 2, we find that the rule change would have a greater impact on NPE plaintiffs (26% would have been able to file in the same district vs. 40% of OpCos) than OpCo plaintiffs, but that many OpCos – about 50% – would also have had to file outside of their past venues. This makes intuitive sense as plaintiffs often prefer to file in their home court, that, even if not generically plaintiff friendly, nonetheless are more convenient and represent areas where the plaintiff’s witnesses, as well as employees, are located. Where would the cases go? We used the steps described above to determine likely venues for all but the “no match” cases, with the results shown in Figure 3. For the reasons described above – principally that we cannot be sure where plaintiffs would sue, particularly outside of their own past patterns – the data presented here are suggestive, rather than definitive, of projected patterns. With these caveats in mind, it appears that the Delaware would be the top venue, capturing 33% of the cases, followed by the Northern District of California with 21% of cases, and the ED Tex, with 11% of the cases. So, where does this leave us? Many cases would have to move, and not just those filed by NPEs. Even so, a decent number of cases could have stayed in the same location. That Delaware and Northern California would be the most popular is unsurprising given how many defendants are incorporated in Delaware or headquartered in Silicon Valley. Perhaps more surprising is that Eastern Texas remains third on the list, albeit with a much smaller percent of cases. These cases would likely be filed against retailers selling patented goods from stores located in that district, though there were some defendants in our sample that were headquartered there. In conclusion, changes to venue rules would likely cause real changes to venue locations. Not all the cases would move to Delaware (as some might have expected), but a decent number likely would. Though some plaintiffs would be inconvenienced, there would be much more diversity in patent venues, with many districts seeing more cases than they have in some time, and a few districts seeing many fewer. While we leave analysis of the legal merits to others, we are literally and figuratively of two minds with respect to this outcome. On the one hand, ending the Eastern District of Texas hegemony would be a good thing. On the other hand, one of us has litigated patent cases in unpopular districts and warns that defendants should be careful what they wish for; there is a reason why so many “specialist” district court proposals have been made. To the extent that some percentage of patent cases have been made possible solely because of favorable venue, we would expect to see dynamic effects as well, should the Federal Circuit recalibrate patent venue to its nearly century old equilibrium. If Congress doesn’t like the result, it can always act. We thank Lex Machina for providing us with case data, Unified Patents for providing us with entity codings, and research assistants Reuben Bauer, Emma Stone, Campbell Yore, Max Looper, Amanda Garger, Christie Larochelle, for help with coding. At the recent Mizzou-USPTO symposium there was some discussion about whether the European Patent Office (EPO) has positioned itself as a more favorable patent venue than the US. Most practitioners will agree that the US is now more restrictive in terms of subject matter eligibility and the new pan-European patent enforcement court makes those patents obtained in Europe more all the more valuable. Today, the EPO released a set of data that makes these prognostications appear to ring true. 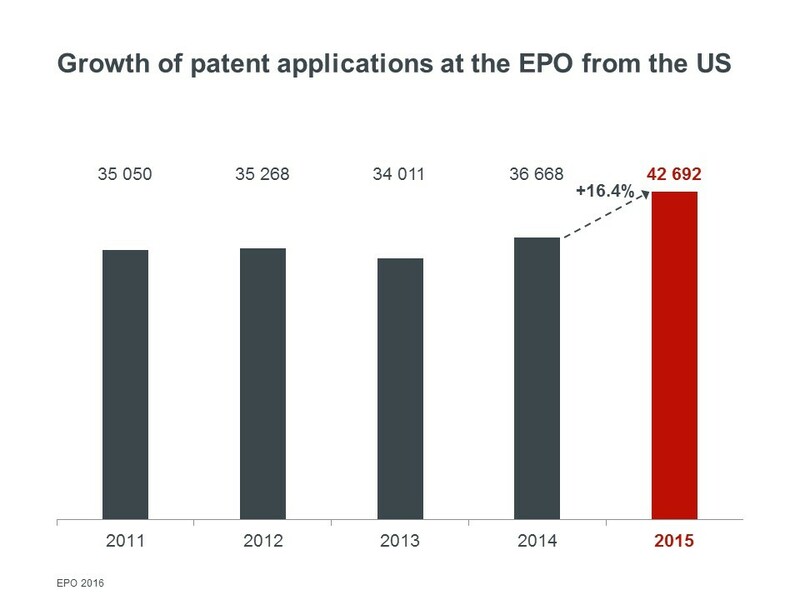 The first chart below shows that the number of EPO patent applications coming from the US grew substantially over the past year (up 16.4%). Top US-based EPO filers include United Technologies (UTX), Qualcomm, GE, Intel, Microsoft, J&J, and Honeywell – with these top seven collectively representing about 20% of the US-based EPO applications filed in 2015. Some major U.S. filers (such as AT&T and GM) did not make the list. UTX was not patent powerhouse in recent decades, but has ramped-up filings over the past few years. The growth in applications from the US almost accounts for the entire increase in filings over 2014. Although these are year-to-year changes, it is important to consider that the impacts will linger in the system for the next 20 years. Joshua Wolson: Will The Supreme Court Save Apple From Itself? Clark Asay: Does Innovation Mean Patent Licensing Demands? Ed Walsh: The Supreme Court To Decide Claim Interpretation. But Until Then, What? In the pending mandamus action of TC Heartland, the merits panel has taken one step forward by ordering oral arguments – set for March 11, 2016. Although the order was a per curiam decision by the Merits Panel, it does not, on its face, reveal the identity of the three judge panel. The petition asks the Federal Circuit to change its rule on patent venue and personal jurisdiction. If the petitioner here wins, we could see a dramatic shift in the geographic distribution of patent cases. In other words, it would become much more difficult to bring an infringement action in the ongoing hot-spot of the Eastern District of Texas. The pending Federal Circuit mandamus action of In re TC Heartland involves an interesting legal question that has now been fully briefed. The Federal Circuit has not yet announced whether it will hold oral arguments in the patent venue debate. In the dispute, Heartland has asked the court to reconsider its interpretation of the patent venue statute 28 U.S.C. § 1400(b) and order that the limiting elements of the provision be given effect. Under the proposed interpretation, a patent infringement case could only be filed in districts either (1) the defendant resides or (2) the defendant has both committed acts of infringement and has a regular and established place of business. This proposal stems directly from the language of 28 U.S.C. § 1400(b) which requires either (1) residency or (2) a combination of infringing acts plus a regular-place-of-business as a prerequisite to proper patent venue. For the past several decades the limits of § 1400(b) have been given essentially no weight after being undermined by 28 U.S.C. § 1391(c). This broadened provision undermines § 1400(b) by providing a very broad definition of the term “resides” — indicating that that “except as otherwise provided by law,” a defendant will be deemed to “reside” in any venue where the defendant is subject to that court’s personal jurisdiction in the action at hand. When § 1400(b) and § 1391(c) are read together, it appears that patent cases can be filed in any venue with personal jurisdiction over the defendant. The point of the TC Heartland mandamus action is that those two provisions should not be read together, but instead, the more traditional and limited definition of “residency” should apply when interpreting 1400(b). If the Federal Circuit (or Supreme Court) were to flip on this, we would see a major impact on the current concentration of venue in the Eastern District of Texas. The petition also argues for a recognition of limits on personal jurisdiction. In particular, the petition argues that a court should not automatically have jurisdiction to rule on acts of infringement that occurred in another state when the court’s personal jurisdiction over the defendant is derived from the specific alleged acts of infringement in the forum state (specific jurisdiction vs general jurisdiction). The logical key to the argument here is the legal fiction that each infringing act is a separate and distinct infringement – as such, sales in Delaware should not automatically give the Delaware courts jurisdiction to rule on whether sales in New York or California were infringing. This case is certainly one to watch.